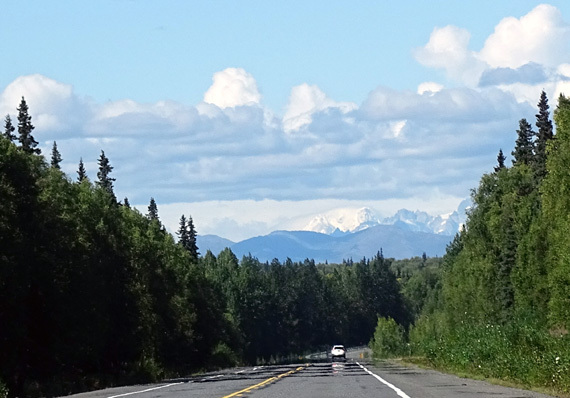 passes through some of the grandest scenery that Alaska has to offer." 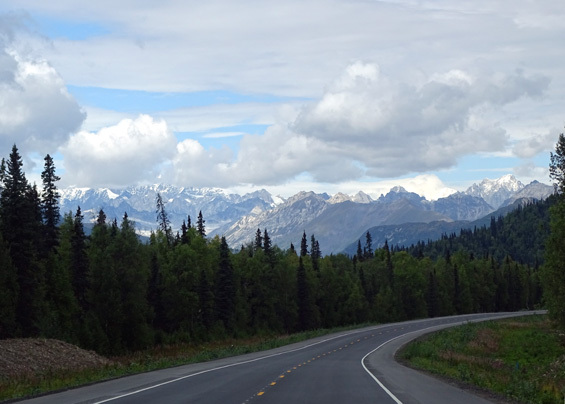 And if you're lucky enough to travel on the Parks Highway -- the name most commonly used -- when the weather is clear, you can see all that grand scenery! Just sayin'. 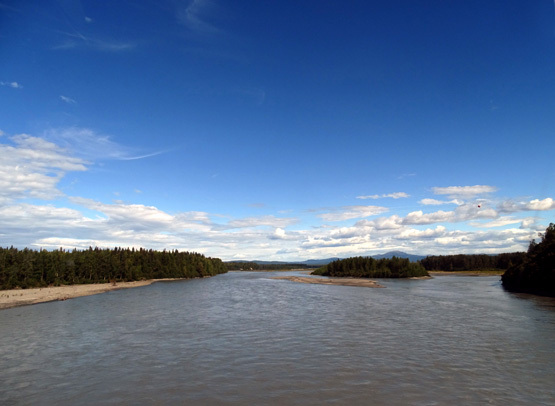 We're back at Denali for the second time this summer, with reservations at Riley Creek Campground for eight days. 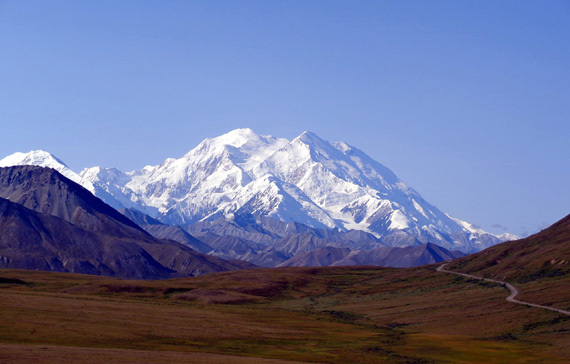 The weather forecast of rain and snow for the next week at Denali is not conducive to being outside doing all the things we want to do, however, so we'll take it one day at a time. 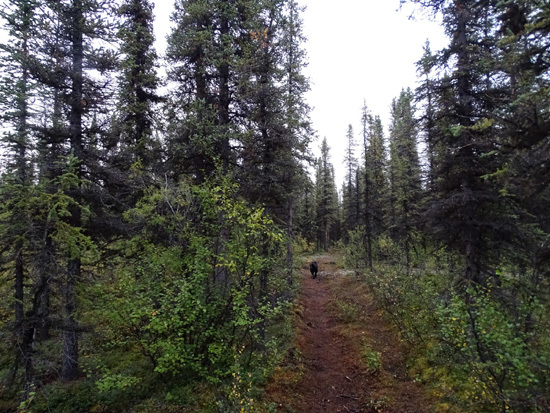 Since we've done all the "inside" activities here that we want to do in three previous visits to the park -- twice in 2012 and once this July -- we will leave early if it's just too miserable to hike, bike, and sightsee. Our new site, the best one all summer! We got a tiny bit of blue sky this evening. We've driven this route several times and this was one of the more miserable times because of rain and/overcast skies on both Saturday and Sunday. 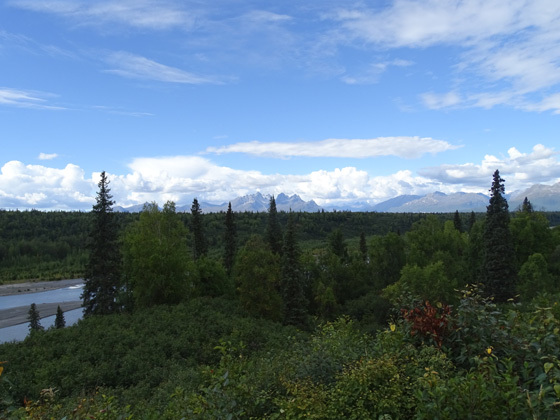 I'm glad we've been able to enjoy the gorgeous mountain scenery, including views of Denali, a couple times previously. Yesterday we couldn't see it from the south viewpoint on the Parks Highway but we caught glimpses of it at the north viewpoint and a little past that. 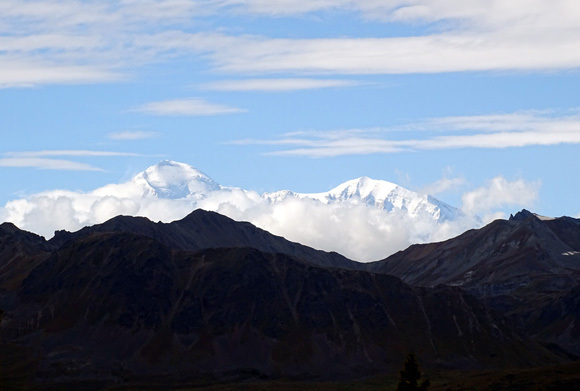 Arrow marks Denali's peaks from north viewpoint. This is just a tease; I'll show closer views later in this entry. 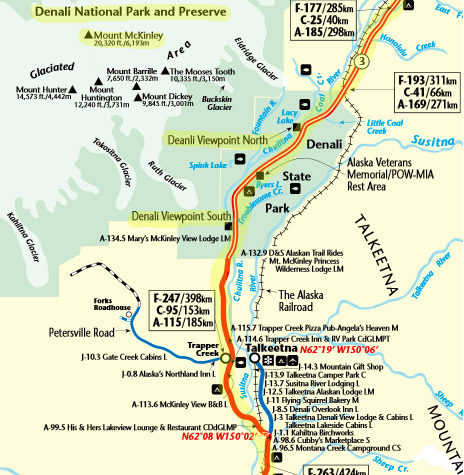 We drove most of the way up to Denali yesterday (Saturday) and stayed overnight at a large pull-off ten miles south of the park we could get to there early this morning. 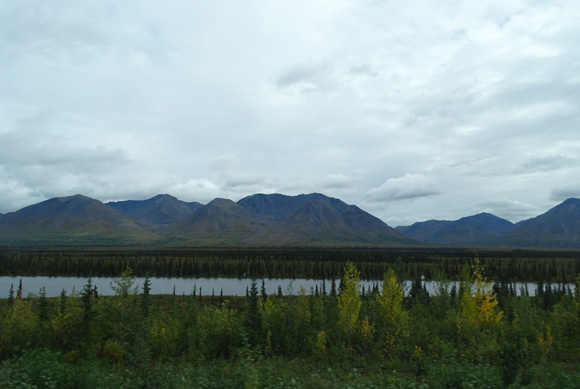 We drove north from MP 8 on the Glenn Hwy. (JBER's Richardson Gate) for several miles to the intersection with the Parks Hwy. 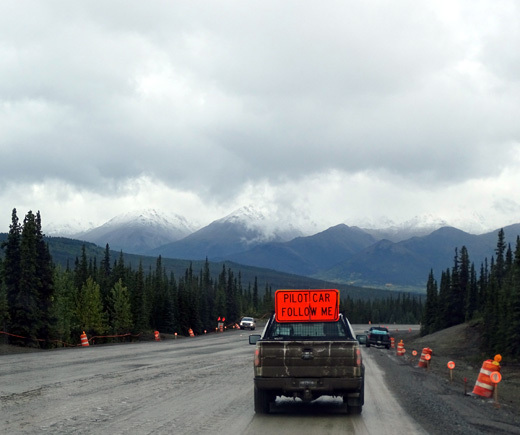 We were on that road the rest of the way to Denali. 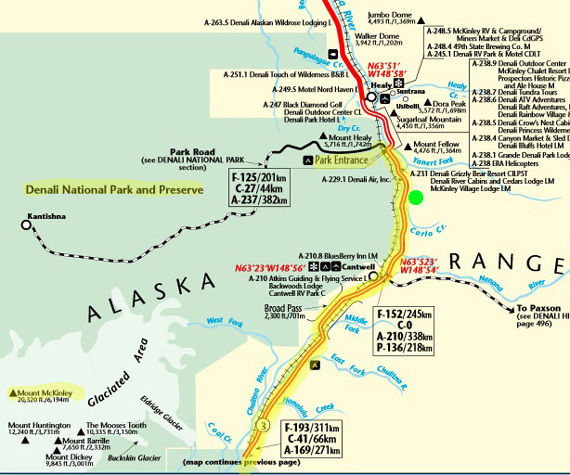 Here are two map sections from The Milepost website; read them from the bottom up. I highlighted our route in yellow. The green dot on the top map is about where we stayed Saturday night. 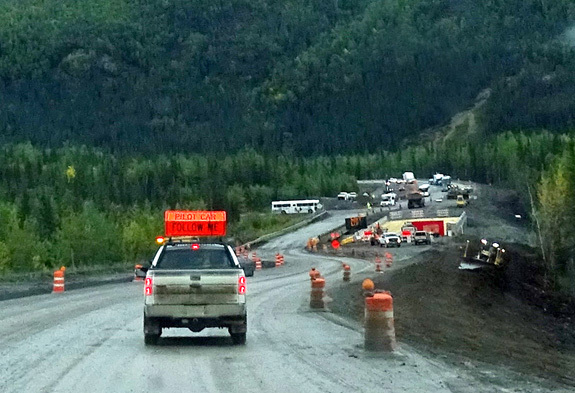 We just missed getting to drive over the new bridge across the Eagle River near the town of Eagle in the north metro area; it opened a few hours after we passed that area. 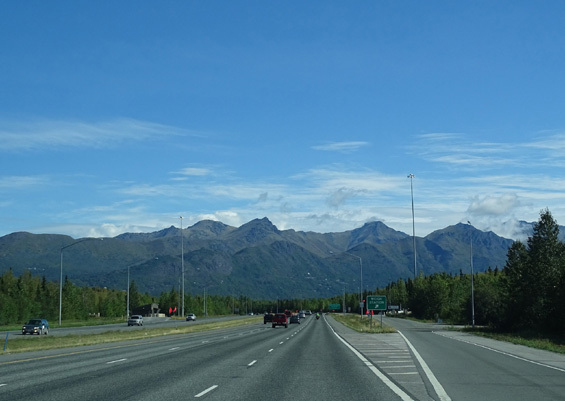 Traffic was rather heavy on Saturday from Anchorage to Wasilla, then pretty light the remainder of the way. 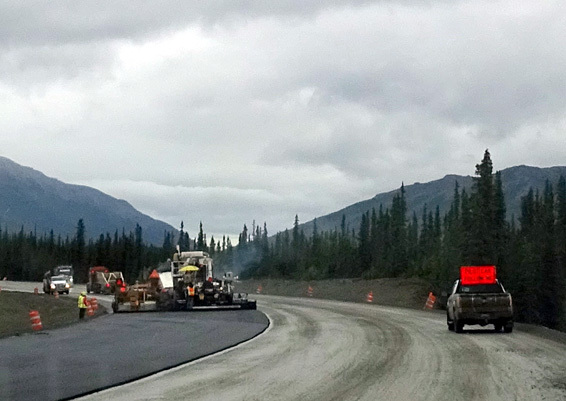 The Parks Highway was in better shape than we expected; we really appreciated the new pavement in areas that were under construction when we came up here in July. We took our time getting ready to leave yesterday morning. Jim topped off the tank with $3.27/gallon diesel on base. The average price in the Lower 48 is $2.62. With gas prices continuing to fall, we hope to see even better prices when we get down there sometime in September. 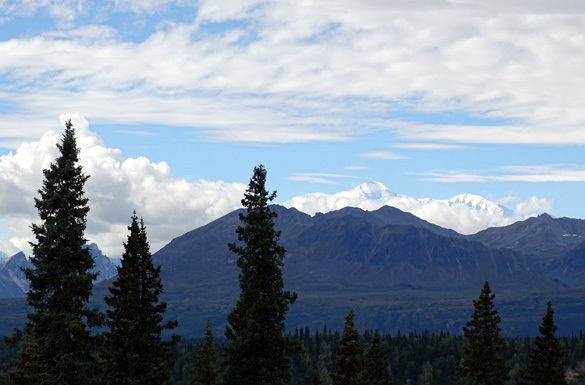 Mountains in the foreground blocked most of Denali at the north viewpoint. 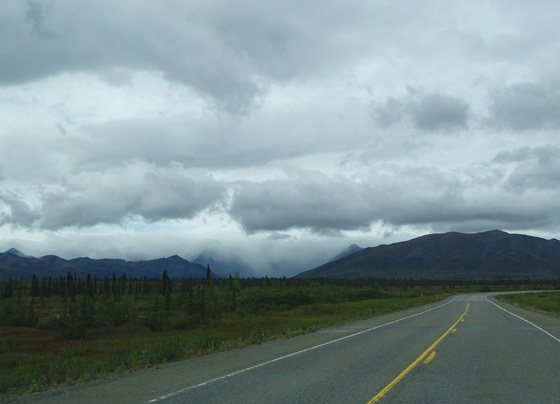 It was raining by the time we got to Cantwell (MP 210) and a little farther north to the pull-off where we stayed overnight. At higher elevations above 2,000 feet the low shrubbery leaves are turning red like I saw on my last hike to Eagle Lake. 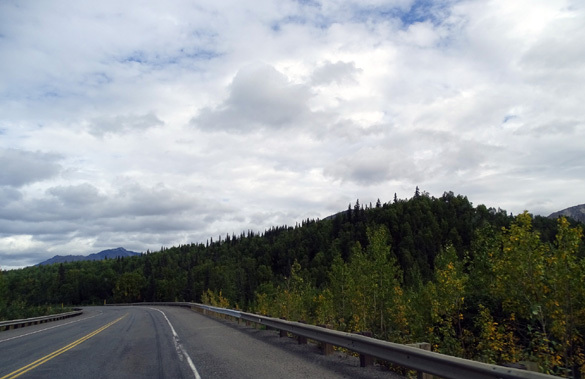 Aspens and/or birch leaves are still green in Anchorage but turning yellow and orange farther north and at higher elevations. We got up over 2,400 feet on Broad Pass. 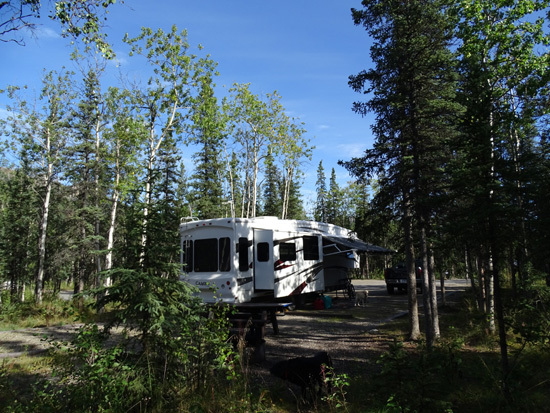 Back in 2012 we quickly learned a few tricks about getting an appropriate site at Riley Creek Campground. In addition to making our reservation for an "A" site, the larger ones, at the first opportunity (December 1 of the previous year), there are some tricks to employ on the first day of arrival. They worked in July of this year and we didn't have to modify them much for this visit. 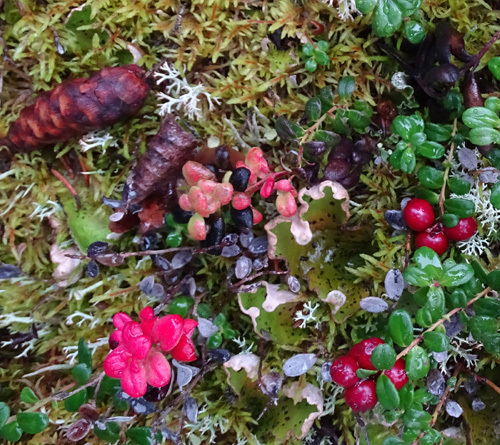 green leaves, red berries, moss, lichens, and more. 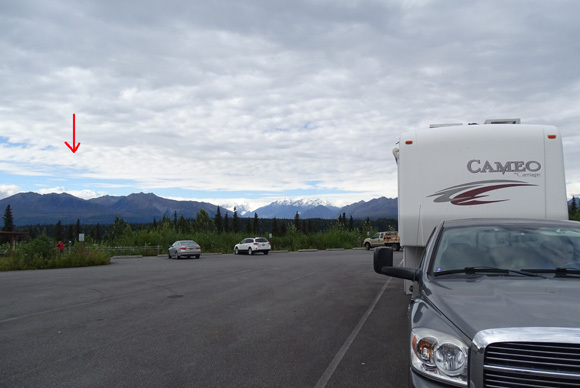 One thing we did differently was to park overnight about as close to Denali as possible. 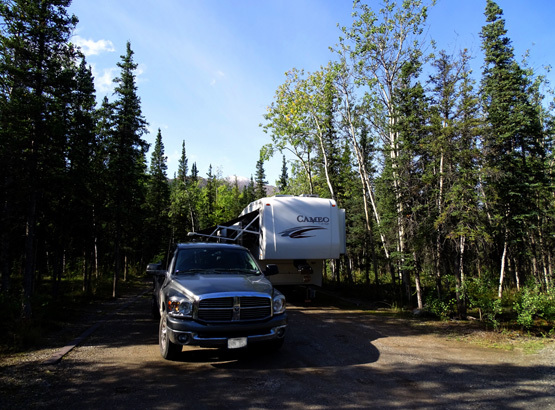 We didn't like staying at the costly RV park in Cantwell in July so we scouted out free options farther north along the highway for this trip. A smaller RV pulled in later in the evening but it was so far back we didn't even notice the occupants. The white stuff on the ground in the picture above isn't snow, although snow fell on nearby mountain peaks overnight when it was raining down at our level. 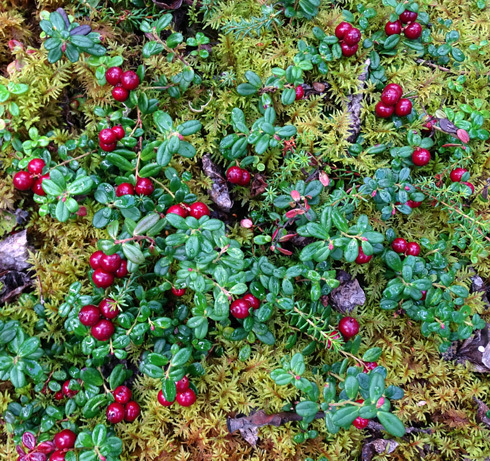 The white is a type of lichen. 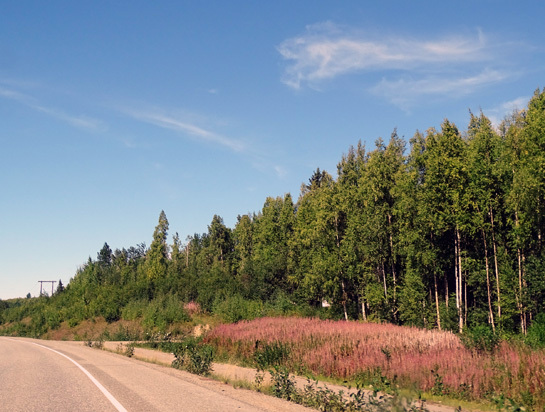 Although there was some road noise this pull-off is far enough off the highway that it wasn't a problem when we were sleeping. Not a bad deal for "free!" 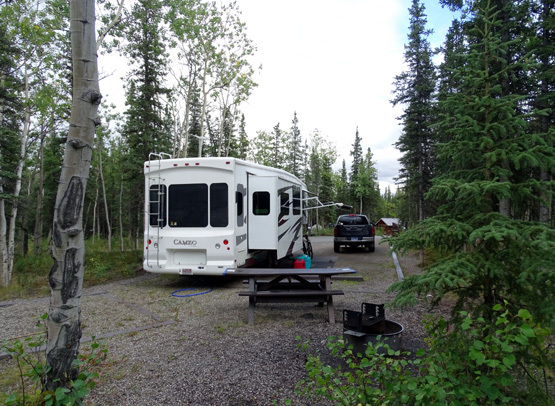 And our MO for staying here overnight worked well because we could easily arrive at Riley Creek Campground early enough this morning to get our very favorite site -- we had it one time in 2012 -- with minimal driving to get there. Short distance, for sure -- only ten miles -- but plenty long on time. It took us an hour. What a mess. We really hoped they'd have gotten more of this done since we were here in July . . . Note the new snow on the mountaintops. It was slow going over muddy gravel breaks following the pilot vehicles. In addition to two stops for the road work, we got the truck and camper dirty again and can't wash them as well as we'd like at the park campground. Perhaps what surprised me most was watching them pour new asphalt in the rain! Good thing they can, since the window of opportunity to do road work is so short up here and it rains a lot in the summer. 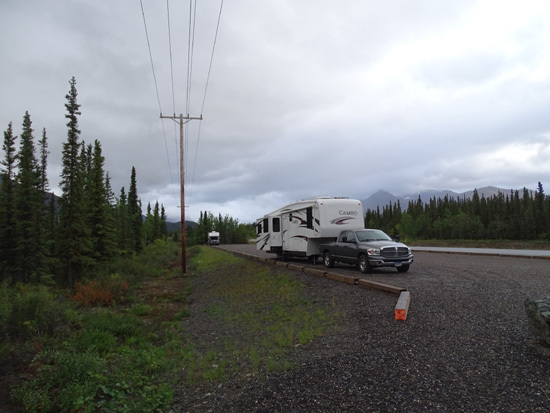 Our plan to park nearby overnight worked again to get to the campground early for the best choice of sites. If we hadn't seen one already vacated, we could at least see the dates on the posts to know if other suitable sites (i.e., large enough for our rig and truck) would be vacated this morning. Fortunately, when we drove through the Bear Loop at 9:15 AM our very favorite site was already empty and available!! I took the two sunny photos the next day. We didn't need to look any farther. We checked in and I went back to hold the spot while Jim took the Cameo to the dump station for fresh water and a partial rinse. This is our fifth time at Riley Creek. We had this site for a few days in 2012 and loved it. 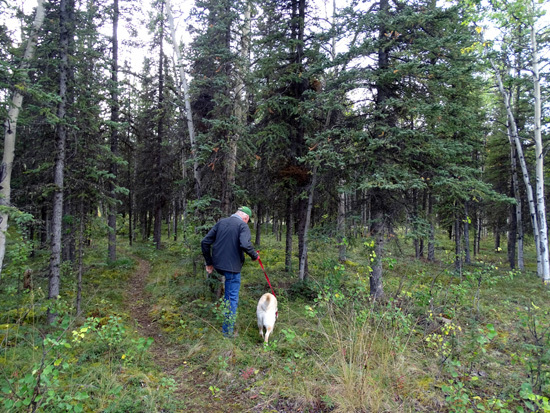 We still love it -- double width, deep, plenty of room for the truck, great big "back yard" (forest) to walk the dogs, lots of privacy from nearby sites, and fairly close to a bathroom. Jim loves it for all those reasons and also because it's easy to back into. Wish every RV site in every campground was this big and private! 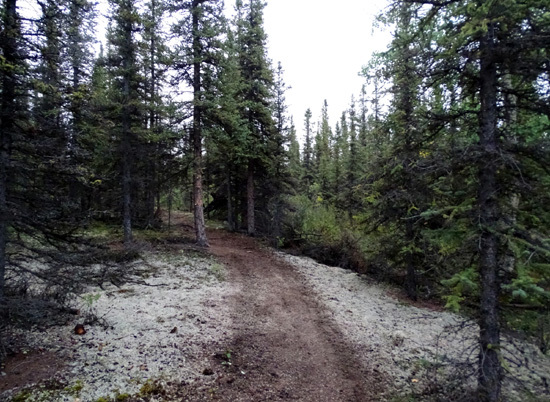 trails but it's OK to walk them all over the campground, bike path, and park roads. Casey because she likes to swallow those -- not good for her! The whole campground was full last night and again tonight. Although several sites were vacated this morning there weren't very many open when we came in. We totally lucked out getting this site. It's good to be back at Denali!